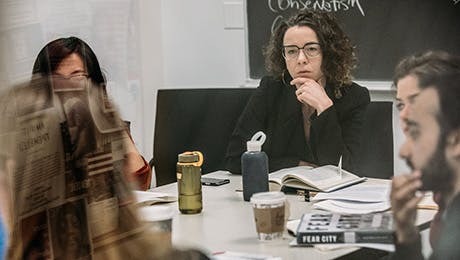 The Center for Graduate Career and Professional Development supports New School for Social Research master’s and PhD students as well as alumni as they explore, prepare for, and choose meaningful careers. Responsive, caring, and personal, we uphold The New School’s commitment to social justice by connecting students and employers who aim to tackle today’s most pressing social issues. We pair students with advisors who have area-specific knowledge to aid their career advancement or to help them transition to a new field. Around the world, our alumni are engaged in and leading meaningful work in academic institutions, nonprofits, think tanks, all levels of government, international organizations, banking, and for-profit enterprises. Career preparation begins the moment you step onto campus. Our office encourages you to engage in activities that strengthen your career readiness as early as possible and to meet with our expert career advisors, who can assist you with all aspects of career development. Our workshops show students and alumni how to frame strengths and accomplishments to align with skills and values. Themed panel discussions connect job seekers with alumni and employers. Register for any of the sessions below and see a full calendar of dates on Village. Students and alumni can access the latest job listings on Village. Click on the icon in the upper-right-hand corner and select Starfish. Click on My Success Network (from the menu at the left). Find your advisor, who will be listed under Career Services. Click Schedule Appointments, then Sign Up to book an appointment.